If you want to know the best top AoE attack type ninjas in the game, here's a table to help you. - A damage ranking based on the damage output of Ninjutsus and Secret Techniques (ST) by AoE (Area of Effect) type ninjas. Note that added effects like Immobilization or Jutsu Sealing will not be considered here, we'll only focus on their damage output. 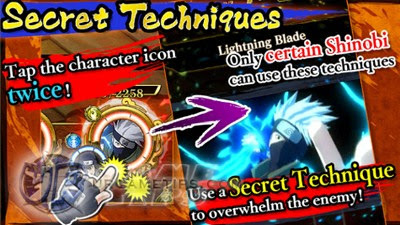 - Name and their Ninjutsu (default) or Secret Technique (if available), both will get a separate set of stats to show the difference of the two. - If a ninja has a (+Boost) next to his/her name, that means that he/she has a Ninjutsu or ST that can boost attack. Boost is applied but the Chakra requirement of that Boost will get added. 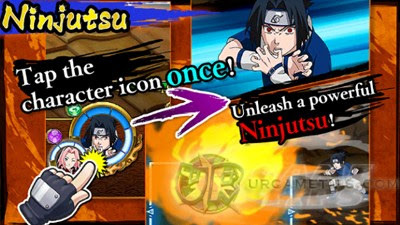 - This will also create 2 Sasuke - Lone Survivor (+Boost and Non-Boosted) for example, to show the difference. - Number of normal attacks, for reference if you want to combo your Jutsus with your ally's normal attack hits. - The number of hits generated by the Ninjutsu or ST. Notable numbers will get highlighted. - Note that getting 15+ combo hits will generate +1 Chakra to all Front ninjas. You might also want to consider this when choosing your single target attack type ninjas for Phantom Castle. - Single Shot Damage: The damage output of a Ninjutsu on a neutral element target, useful if you want to find the highest AoE attack damage for "Chakra Stacking" (example: for dealing high damages to the next wave of tough enemies). - SDMG ignores Chakra requirement, so the notable numbers will get highlighted for reference. - It's a combination of STR, Pills, and ATK multiplier. - Chakra requirement for the Ninjutsu or ST.
- Total Damage Rating (Damage per Chakra): Since we also need to consider their Chakra requirements, TDMG will determine how efficient are they for prolonged fights. - Also useful for Phantom Castle since you can't do "Chakra Stacking" due to the limited number of turns. - Default and MAX Stats of ninjas, used for calculations. New Max Limit Break Stats NEW! - Names with * means that the stats are unupdated and are using non Limit Break default stats. - Guy - Hot-Blooded Youth (ST): A non-boosted ST is not available because his Secret Technique activates with a Boost.